drawings for easy A&P review and reference.Over 56,000 comprehensive, authoritative, high-quality definitions - including expanded definitions for selected entries, particularly major diseases, disorders, and procedures - offer the latest information on pathophysiology, treatment and interventions, and nursing care.23 appendixes - 13 in the dictionary and 10 on the companion Evolve website - offer quick access to useful reference information, such as lab values, symbols and abbreviations, language translation guides, pharmacology, infection control standards, conversion tables, and clinical calculations.A strict, common-sense alphabetical organization with no subentries makes it easy to find key terms and definitions.NEW! Over 300 new and updated illustrations visually clarify key definitions and reflect current health care practice and equipment.NEW! 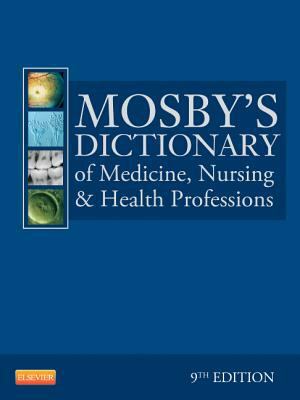 Approximately 11,000 new and revised definitions reflect the latest developments in health care, drugs, and nursing terminology.NEW! Editor Marie O'Toole, EdD, RN, FAAN lends her expertise to this new edition, reviewing and revising all definitions and assembling a team of leading consultants and contributors.